Last week I went for a Pantry Staples Class by Saee where I learned how to make some easy condiments, spreads, etc., which are all part of our pantry and which we invariably pick up on our weekly grocery runs. It was a revelation just how easy some of these are to make and the proof of that ease is the fact that I didn't even wait a week to try out one of the recipes! Ketchup is something we consume in large quantities and it is on my shopping list very often. A recent discussion on a Facebook group revealed the fact that the immensely popular brand of tomato ketchup that I'd been buying contains barely 20% tomatoes. I checked the ingredients on the label and found that it contains 28% tomato paste. Just 28%?! What was the remaining 72% then? 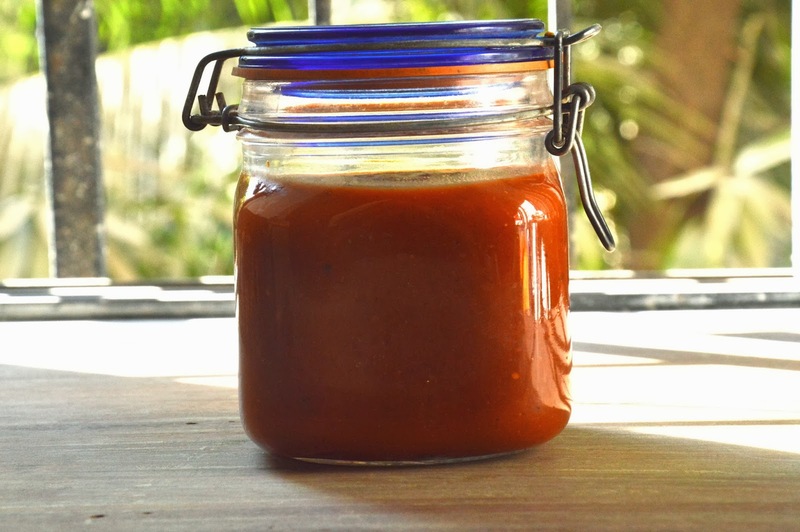 Since I had seen just how easy making ketchup was and I had the recipe at hand, tomato ketchup is what I chose to make. I didn't get all the ingredients listed on the original recipe and have tweaked the recipe a little. However, the original recipe is superb and I will make that too. 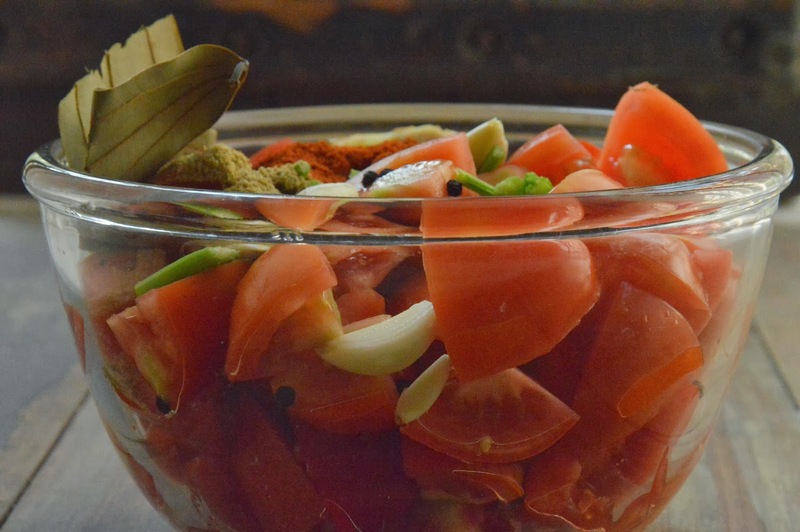 I'm sharing Saee's recipe here and I will mention what I changed in the recipe as I go. Wash the tomatoes and cube into large pieces. 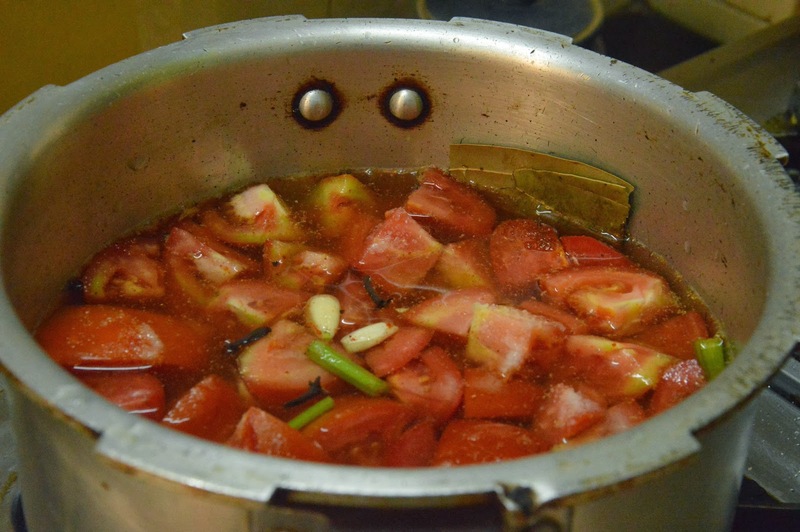 Place all the ingredients barring the sugar and the tomato puree, into a pressure cooker with 2 cups water and cook till the tomatoes are soft. Remember to chop up the ginger so it gets cooked through. I forgot and had to chop it and mash it later. Once cooked let it cool. Discard the bay leaves. 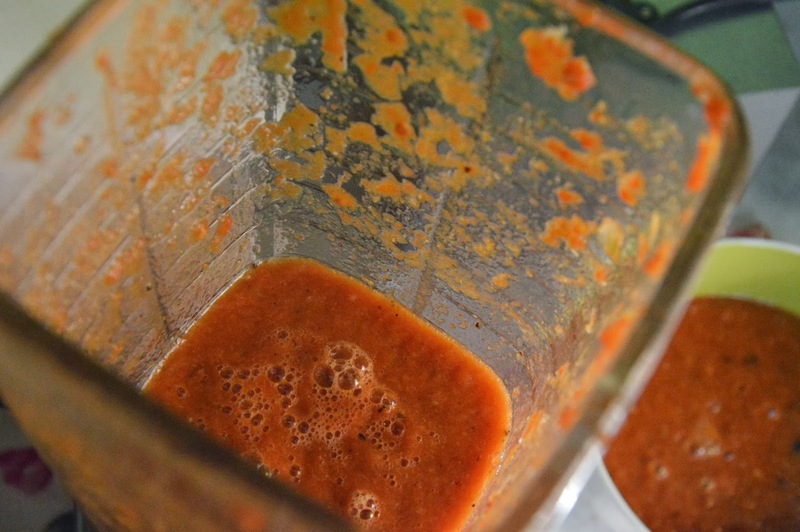 Blend the cooked tomato mix in your electric mixer. A note of caution - let the boiled tomato mix cool a little before you put it into your blender, especially if it has a glass jar. Don't fill too much or the hot liquid can splash out and burn you badly. While puréeing is an easy process it is one that you must do with a little care. Once the tomatoes are blended quite smooth, pass the mix through a sieve. Press hard and coax as much of the mixture through as possible. You will need a sieve that has a reasonably wide mesh that allows the pulp to pass through. I didn't have one and ended up having to puree the mix seeds and all in my liquidiser. The sieved pulp is definitely better as the seeds can give the ketchup a slightly bitter layer of flavour. Sieving also ensures you get a really smooth ketchup as your final product. Now pour the sieved mixture into a thick bottomed vessel and bring it to a boil. Add the tomato puree and the sugar at this stage. Let it bubble nicely and reduce the heat and let it cook for 30 to 45 minutes on a lowered flame. The watery sauce has to reduce and thicken. Taste it and adjust salt and sugar as required. The ketchup will thicken a little after it has cooled. Here's what my ketchup finally looked like. Decant into a clean sterilised bottle and REFRIGERATE. This recipe uses no preservatives at all and the ketchup will spoil if left on your pantry shelf so refrigerate it without fail. If you're making a large quantity, divide into smaller batches so you can take it out a little at a time and use it up portion by portion. If you can get your hands on these chillies use them for sure. They will add amazing colour to your ketchup. I couldn't get them for this batch but I really wish I had. * My blogger friend Manisha pointed out that bay leaves are vastly different from Tej Patta (what we in India commonly call Bay Leaves). So in case you're a reader from Europe, America or anywhere outside India, you need to use what we call Tej Patta. There's no English word for it. You can read Manisha's post about the difference between Tej Patta and Bay leaves here. There are pictures to illustrate the difference too. Wowo i can imagine the taste. Love the recipe. 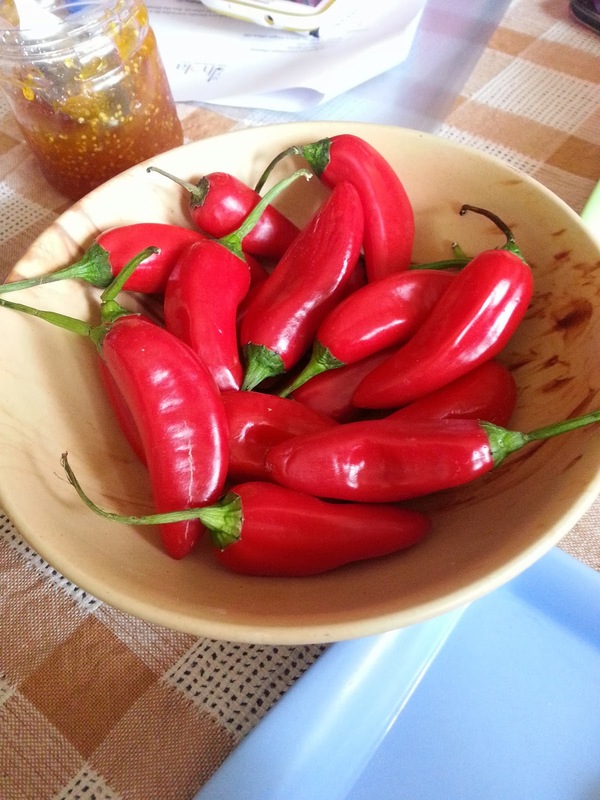 And i love the pic of those chilies. I am thinking of making this in a day or two. Is it essential to add the chillies? My daughter would not have spiced tomato sauce and could we omit the tomato puree? What does the ingredient add to the recipe ? I have no clue and hence the question. You can leave out the chillies and make a non spicy version Vidya. Add some kashmiri chilli powder for the colour. 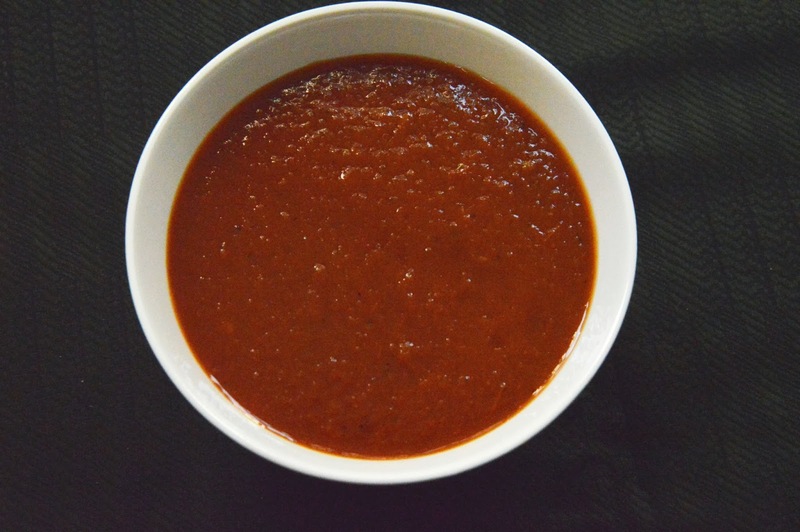 The tomato puree also enhances the colour and smoothness of the ketchup. Feel free to leave it out if you like. You will need to increase the amount of tomatoes if you do.